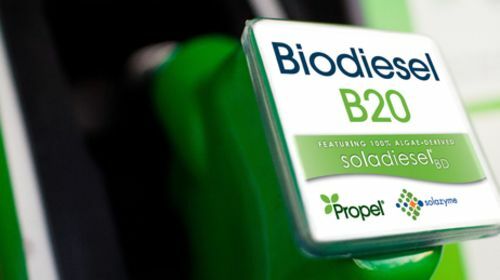 Solazyme's algae based biodiesel is being sold through Propel Fuels stations in the SF Bay Area. Driving cleaner isn't limited to choosing between a high fuel efficiency engine, or an electric or hybrid vehicle. Another option is to drive on biofuels like biodiesel or ethanol, but both of those involve diverting food to be made into fuel. On Tuesday, Solazyme began offering commercial sales of a biodiesel derived from commercially grown algae rather than derived from food. The fuel, which Solazyme calls Soladiesel, is available through San Francisco Bay Area stations owned by Propel Fuels. Propel specializes in supplying "low carbon fuels and clean mobility solutions." Solazyme’s SoladieselBD meets or exceeds ASTM quality specifications and has shown performance enhancements including cold temperature operating performance. In the past, biodiesel users have complained about poor performance in cold weather. The company is compatible with existing diesel engines. Solazyme's technology works by feeding algae with sugars, which the algae eats and converts into oil. The algae is grown in standard industrial fermentation equipment. Solazyme claims the process is fast and efficient. Clearly comparing oil production in this method versus the millions of years it takes the planet to grow a pool of oil, the Solazyme process is a zillion times faster. Because the fuel created by this process contains carbon that was already in the ecosphere, whereas fuels derived from fossil oil are desequestering carbon that had been sequestered a million or more years ago. To the extent that climate change is caused by increasing the carbon in the atmosphere, a biofuel makes much less of a climate change concern than is a fossil fuel. Solazyme has been in existence for 9 years and is only now getting to commercial production. “Solazyme’s revolutionary algae-based technology platform has supplied our development partners and customers with advanced biofuels that meet or exceed some of the world’s most stringent fuels specifications and requirements, “ said Bob Ames, VP of Fuels, Solazyme. “We’ve successfully demonstrated our land-based fuels in fleet vehicles and corporate busses, and are excited about this pilot program with Propel because it enables us to make these fuels available to the public."